Why do sports matter so much to so many people? And why should we care? Far from a distraction or a trivial past time, sports tell us deep truths about ourselves. Big-time sports are a particularly potent mirror for humanity—reflecting both our promising possibilities and our demonic distortions. 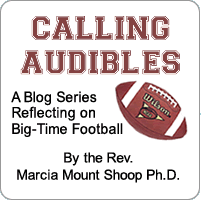 Theologian and football coach’s wife, Marcia Mount Shoop, invites you to take a closer look at the hold that sports have on us. This book takes you beneath the veil in some of the most challenging issues in sports today: fanaticism, sexism, racism, and abuse of power. And beneath the lifted veil you also encounter wisdom about how we can find our way back to what is most life giving about sports. If you love sports or if you just wonder why others do, Touchdowns for Jesus will give you a whole new way to view the games people play. Throw out the playbook. This is not a conventional play–and certainly not a conventional book about big-time sports and theology. Marcia has written an incredibly thoughtful and insightful perspective for all of us rabid sports fans to consider. Reading this book will help all of us in examining our faith and how it plays out in our day-to-day devotion to big-time sports in our society. Reverend Marcia Shoop is a powerful woman and a great writer. Her intelligence, education, and compassion provide her rare insights into sports. She has been close enough to this insane world to know how it works, but removed enough to clearly and honestly discuss what’s right and wrong about the games we watch and the machines that drive them. Mount Shoops’s new book, Touchdowns for Jesus and Other Signs of Apocalypse, will become a classic for everyone, from fans to scholars, looking to frame collegiate sports in a way that offers tangible ideas and inspiration for refashioning this billion dollar industry so that it insures student-athletes are accepted, nurtured, and prepared for the championship we call life. Mount Shoop combines her knowledge as a feminist theologian and ordained minister with her years of experience as a football coach’s wife to navigate the reader through a spiritual journey into the world of big time sports. Shaped by her religiously informed feminist commitment to social justice, Mount Shoop offers revelations on sports’s potential for redemption and what we as a society can do to create a more equitable world for athletes, coaches, fans, and communities. A must read for anyone concerned with the sexism, racism, and institutional power and abuse that plagues big time sports in the United States. Regardless of the regularity of sport scandals, we as an American society continue to ‘repeat and repent’ our transgressions in this irresistible industry. With a spiritual lens and insider’s perspective, Shoop provides an intellectual and passionate framework to dissect our involvement and passion for sport competition. A far notion from a ‘Hail Mary,’ Touchdowns for Jesus scores with ease as a must-read for critical conversations that foster solutions to the numerous challenges of sport. Marcia Mount Shoop is a theologian, author, and preacher as well as a mother and football coach’s wife. She has a PhD in Religious Studies from Emory University and a Master of Divinity from Vanderbilt University. Her first book, Let the Bones Dance: Embodiment and the Body of Christ, was released in 2010. For most of her life she has worked on issues of dialogue and relationship around race, political polarization, and religious differences in academic, church, and community contexts. She blogs on everything from faith to football at marciamountshoop.com. Her husband of almost twenty years, John Shoop, has coached in the NFL and in Division I College football for over twenty years. Marcia is the fourth generation in her family ordained to the Ministry of Word and Sacrament in the Presbyterian Church. While completing her dissertation at Emory in 2002, Marcia received her first call to the ministry. Since then she has served the Presbyterian Church and in other denominational settings in many different capacities across the country as pastor, preacher, teacher, and consultant. She has also served the national church in leadership positions with stints as Moderator of the Presbyterian Multicultural Network (PMN) and as Vice Moderator of the Committee on the Office of the General Assembly (COGA).